The Harvard CRDS/ICOS instrument is an absorption spectrometer that uses the relatively new and highly sensitive techniques of integrated cavity output spectroscopy (ICOS) and cavity ringdown spectroscopy (CRDS) with a high-finesse optical cavity and a cw quantum cascade laser (QCL) source. The primary spectroscopic technique employed is ICOS, in which intra-cavity absorption is measured from the steady-state output of the cavity. Light from a high power, tunable, single mode, solid-state laser source is coupled into a cavity consisting of two concave, highly reflective mirrors (R ≈ 0.9999), through which air continuously flows. 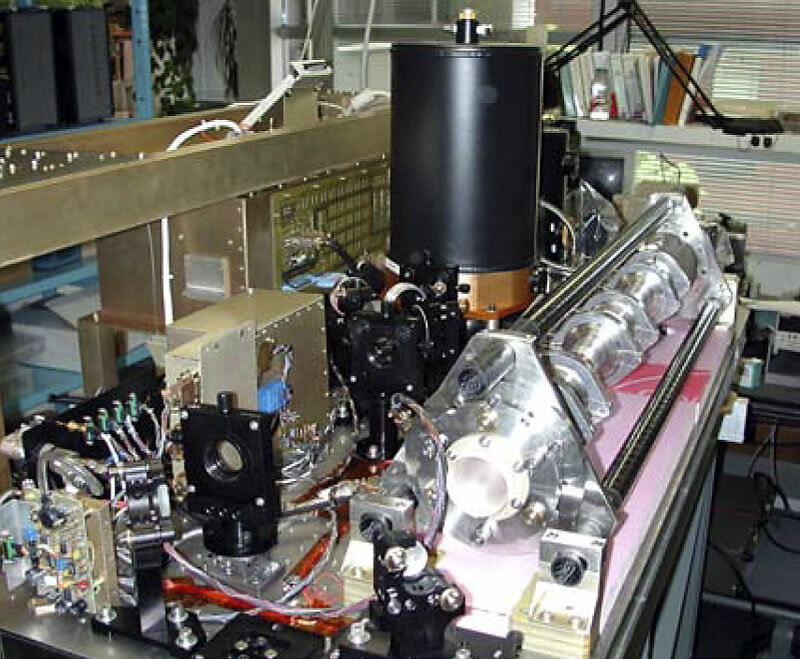 The laser is scanned over a spectral region of 1–2 cm-1 containing an absorption feature, and the cavity output is detected by an LN2-cooled HgCdTe detector. The resultant output approximates an absorption spectrum with an effective pathlength of > 5 km, far greater than that of standard multipass Herriott or White cells. Paul, J. B., L. Lapson, and G. Anderson (2001), Ultrasensitive absorption spectroscopy with a high-finesse optical cavity and off-axis alignment, Appl. Opt., 40, 4904-4910.